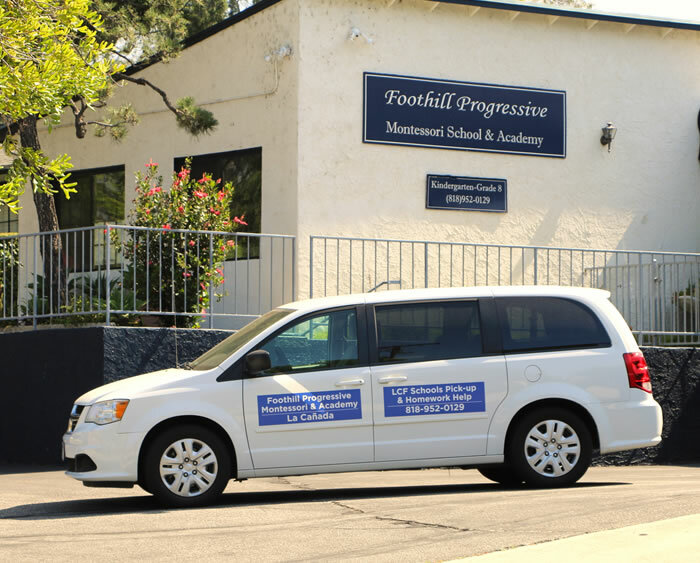 Our daycare program at Foothill progressive Montessori provides a fun, safe, educational and nurturing place for children before and after school. Children join us for our morning daycare program at 7:00 am where they have time to relax and join in the daily academic’s routine at 9:00am until it’s time for them to attend their regular public school. We offer a drop off service to all La Canada elementary schools. The afterschool Daycare program begins at 12:00pm for kindergarten and 2:00 pm & 3:00 pm for older students and stays open until 6:00pm. We offer pick up from all La Canada schools. The children in our kindergarten afterschool program join in our regular curriculum. We offer homework help and work with them in Math, Language arts and any other subject matter that is being taught in our regular curriculum. Our daily routine provides time in the afterschool hours for children to relax, exercise their bodies and minds and to explore their own interest. Supervised afterschool study halls are available Monday through Friday for grades 1 - 4 as part of our afterschool daycare program. The study halls provide students with the opportunity to get a head start on homework assignments or make up missed or unfinished work before they head home or out to play at daycare. For those children who join us for our afterschool program from other schools this is also a time where our teachers assist them individually and work with them on subjects in which they need extra help. We have a well- developed program which not only offers daycare but offers academic assistance and extra help for children who need that extra support. It is a great opportunity for working parents where you can pick up your children straight after work and spend quality time with them on the way and in the evenings without having to worry about completing homework.